NOW that’s what I call a moon! With over 100 moons between them, most of the Solar System satellites can be found around our gas giants – Saturn and Jupiter. Similar to planet formation, moons are thought to form in gaseous circumplanetary disks (CPDs) which surround giant planets during their later stages of formation. But, what about smaller planets like Neptune and Uranus? Today’s bite delves into the world of radiative hydrodynamical simulations to see whether CPDs, and thus moons, could also form around our ice giants. With five major moons based in a similar, circular orbit, it is likely that Uranus formed its moons in a circumplanetary disk. A debris disk, like the one which may have formed our Moon, is unlikely because such satellites formed this way would have very little water and this is not what we observe. Neptune, however, is only home to one major moon, Triton, which has an unusual composition and retrograde orbit. Triton is more than likely a captured Kuiper Belt object which is thought to have severely disrupted the dynamics of the Neptunian system. 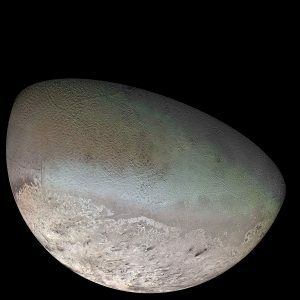 In fact, previous work suggests that without the formation of satellites around Neptune, it wouldn’t have been possible to capture an object like Triton. Forming a moon isn’t an easy job for a planet. Previous studies have revealed that there are two key planetary properties which determine how likely it is for a gaseous CPD to form around a planet – mass and temperature. Mass: Terrestrial planets like Venus are too small for CPDs to form, any satellites that exist around them are usually captured (Mars) or the result of a planet-planet impact (Earth). 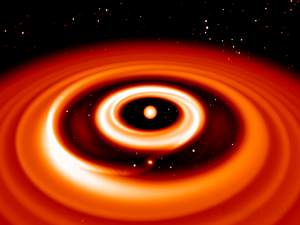 Temperature: CPDs are more likely to form if the planet is cooler BUT a cooler planet radiates its formation heat faster and has less time to form a disk. The authors deployed hydrodynamical simulations to recreate the later stages of planet formation for Uranus and Neptune. This involved setting the planets as point masses in the centre of the simulation surrounded by a gas disk and almost letting simulated nature (heat transfer, ideal gas laws, gravity) take over. For more details regarding hydrodynamical simulations, see this post on simulating the entire universe (!!) and this one on gas accretion. Figure 3: Zooming in to the circumplanetary disk around Uranus (left column) and Neptune (right column). The different rows indicate the planetary surface temperatures: 100 K (top), 500K (middle) and 1000 K (bottom). Figure 1 from paper. 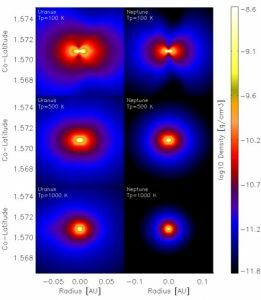 From the gas density plots in figure 3, where yellow/white is the densest region, we see that once the simulated Neptune and Uranus cooled to below 500 K a circumplanetary disk was able to form. This conclusion is drawn visually from the disk-like structure which has formed in the 100 K (top row of figure 3), that is not visible at 500 and 1000 K (middle and bottom row of figure 3) where the gas is mostly distributed in a spherical pattern. It makes sense that both planets require a similar temperature as they are of almost equal mass. Next, the authors created a synthetic population of satellite-forming seeds within the disk to see if these protosatellites will turn into fully-fledged moons by accreting matter. Figure 4: Formation timescale of moons around Uranus (left) with the distribution of their masses on the right. The red vertical lines represent Uranus’ 5 major moons. Figure 2 from paper. In the CPD formed at 100 K (figure 3, top left panel), most moons around Uranus formed over a 500,000 year period and at the location of the disk where the temperature was below the freezing point of water. This means many of these moons will be icy – just like the moon population around Uranus. Masses of moons formed spanned several orders of magnitude which include the masses of the satellites observed today (red lines in figure 4). Moreover, around 5% of their simulations yielded 4-5 planets between 0.5-2 times the mass of the current Uranian satellites. Figure 5: Like figure 4, above, the formation timescale of moons around Neptune (left) with the distribution of their masses on the right. The red vertical line represents the moon Triton. Figure 3 from paper. Similar trends were also observed for Neptune as, once again, the entire population of moons had temperatures below the water freezing point meaning Neptune is also more likely to form icy satellites. Generally simulated Neptune struggled to make moons as massive as Triton, but this isn’t worrying because, remember, it’s likely to be a captured Kuiper Belt object. So, overall, it is possible to form satellites around ice giants! This is an exciting result for exomoon-lovers because Neptune-mass exoplanets are the most common mass-category of exoplanet we’ve found so far. Furthermore, icy moons are the main targets for extraterrestrial life in our own solar system which improves our chances of finding habitable worlds elsewhere.